Fizzing with energy, and laugh-out-loud funny, this is a roller-coaster journey of discovery, which also has an exciting environmental twist - all against the backdrop of beautiful Kerala. 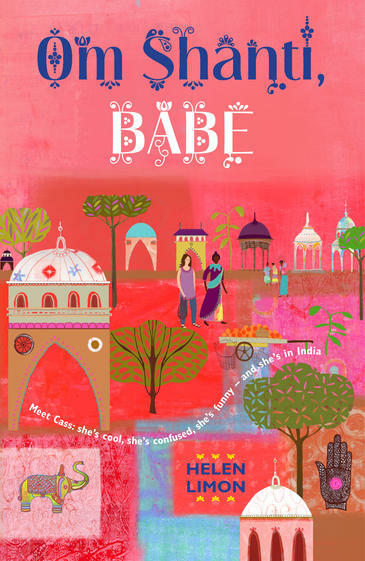 Cassia can't wait for her first visit to India - Bollywood glamour, new friends to admire her uber-cool street-dance moves . But as she steps into real Indian life, NOTHING is as she expected... Cass is with her mum in Kerala, on a buying trip for their Fair Trade craft shop, and everything seems to be going wrong. There's Mum's new romance with "call-me-V" Mr Chaudury for a start, her own prickly stand-off with pretty, fashion-mad Priyanka, and the devastating news that her mum's business may be on the rocks. But then pop idol Jonny Gold arrives at the beach to promote his new song, Om Shanti Babe, sparking a mystery, new friendships and a race to save the mangrove swamps. Cassia loves all things Bollywood, so a trip to India with her Mum is a dream come true. Cassia’s Mum Lula has a shop named after her daughter that sells all sorts of fair trade goodies, all of which she sources from southern India, in a place called Kerala. Cassia wants to be a dancer, not ballet, but street dance and Bollywood. Cass has had a major falling out with some of her friends from school, we find out what exactly as the story unfolds, and she’s decided to drop out of school and work in her mum’s shop until her dancing career takes off. The trip to India opens Cass’s eyes to lots of things, about the world, and her own life. India isn’t all Bollywood Glamour, it’s hot and dusty and scabby dogs roam the streets, plus her Mum is too busy working and spending time with Vikram to do anything fun with her. Cass really just wants to go back to England, away from India and especially away from Vikram, who seems to be more than just her Mum’s friend. A trip to Malabar, a coastal town where Lula’s best friend lives is just the change Cass needed, and she makes a new friend, Priyanka, meets a boy and gets involved in a campaign to save the local mangrove. To top all of this off, she and Priyanka also get the chance to meet their pop idol Jonny Gold! He’s going to be making his new music video right on the beach from where Cass is staying, but it turns out he;s not quite the man they thought he was. What this book is really about is growing up, and realising that we can’t run away from our problems forever, at some point we have to face them and deal with them. It also shows that growing up sometimes means putting other people’s feelings/needs before our own. In Cass’s case, she must accept that her mum has met someone new, and she is happy, and having a happy Mum is a good start to having a happy family. Thank you for including my book, Om Shanti Babe (354) in your year of reading and most especially for your warm review.